At Independent Energy Consultants we are committed to finding our clients the best energy rates and to do that we keep a close eye on all developments in the energy market. This month we would like to talk about an exciting project right here in our own backyard, Cleveland, Ohio. As detailed in a recent article of the Plain Dealer, the City has been exploring a Gasification plant to extract energy from garbage while reducing landfill volume. 1. )Waste is screened and sorted many times by both machines and humans. This keeps recyclables, metals, and harmful materials (batteries, computer parts, etc) out of the process. 2.) The remaining trash is shredded and formed into a pulp with a bonding agent. 3.) The pulp is heated, sterilized, dried and then compressed into pellets. 4.) The outside layer of the pellets is ignited, the pellet mass is brought to over 900 degrees Fahrenheit and then left to smolder much like charcoal. 5.) As the pellets smolder they give off a synthetic gas that is similar to methane (natural gas). This gas is captured and burned to heat water that sterilizes the incoming trash pellet and produce steam that drives a turbine. The turbine is connected to a generator that produces electricity. That electricity can be used to power the plant's equipment and the excess power is sold to the local utility company. 6.) Only 5% of the total waste volume remains after the process and that remaining ash can be used to make bricks. 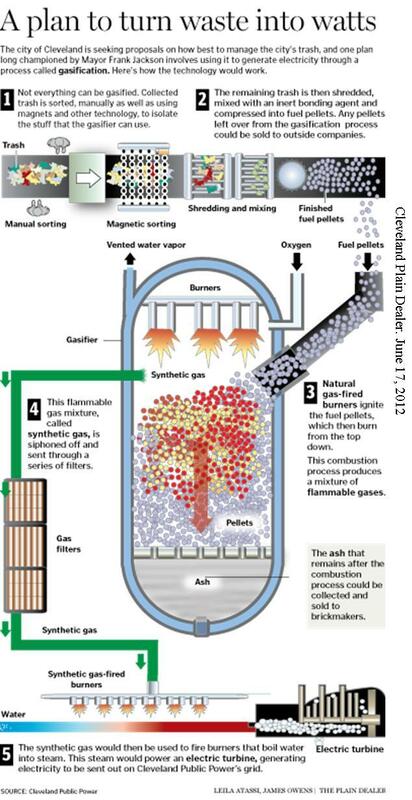 We'd like to point out a few important differences between a Gasification plant and the more commonly used incinerator. An incinerator burns all types of garbage to make steam and drive a turbine, but this process releases large amounts of airborne pollutants and leaves behind ash that has no commercial use. A Gasification plant sorts and separates the waste it takes in to ensure no harmful materials are processed and released into the air. In addition, the byproducts from the Gasification process are cleaner and can be used in many applications. Gasification plants are particularly popular in Asian countries where large amounts of waste are a serious problem. Currently there are 19 plants operating in the United States, a number that may continue to grow in the near future. Cities anxious to find new sources of income are viewing Gasification plants as a viable source of revenue and a much needed job creator. If developed, the Cleveland Gasification plant could be built using existing infrastructure and estimates say it would create over 100 new jobs and could save millions of dollars per year in landfill dumping fees. The power generated from the plant would be sold and add further revenue. More recyclable material would be captured and kept out of landfills, thereby reducing the City's carbon footprint. One thing is known for sure, the trash we generate will continue to come and landfill space is limited.